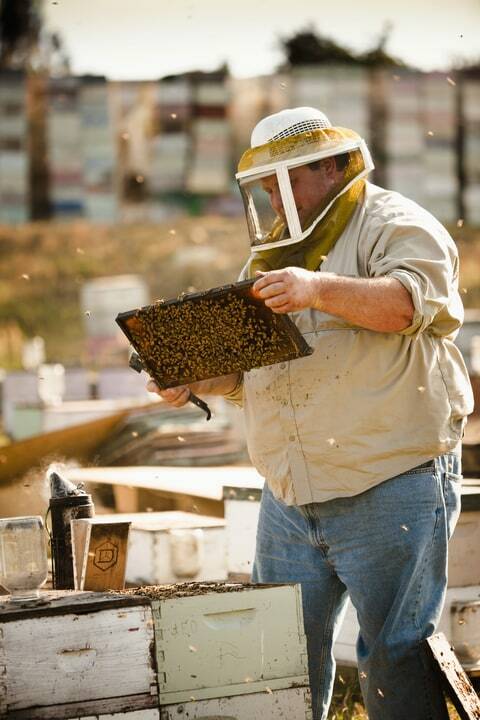 FORT MEADE — Jim Doan pats the bees gently with the flat of his big palm. Without acrimony, the nurse bees and worker bees amble toward the edges of the frame, revealing the larvae underneath. They are fat and pearly, the way they should be. Doan’s bees may be turning the corner, but it’s too early to say. He has lost 300 hives this spring and added 500, netting 200 the hard way. Concerned citizens have read about colony collapse disorder; they may have even heard about varroa mites and the staggering statistic that something is annually killing 30 to 40 percent of bees in the US. We know honey bees are under siege. But Florida honey bees are in even bigger trouble. Hurricane Irma in September added to their existing challenges. According to the Florida Department of Agriculture’s chief apiary inspector David Westervelt, Hurricane Irma drastically compounded the state’s ongoing problem of honey bee colony loss. He says at least 75,000 of Florida’s 600,000 honeybee colonies were affected by the storm: Bees drowned, were blown off course, or died of starvation due to destruction of the nectar- and pollen-rich vegetation on which they forage. And it’s not just about honey. Honey bees are critical to pollinating Florida’s $4 billion blueberry, cantaloupe, cucumber, honeydew, raspberry and watermelon crops. Florida bees matter nationwide: Twenty to 25 percent of the nation’s honey bees pass through Florida, often wintering here to gain strength before or after pollinating California almonds. Beekeepers from New York, Wisconsin, Ohio and Michigan winter their bees in Florida to fortify the hives: In 2006, Florida had 1,000 registered beekeepers, now it’s 5,000. Let’s call them snowbees. The honey bee crisis is often blamed on fungicides, herbicides and pesticides called neonicotinoids. Not so fast, say researchers like University of Florida apicultural scientist Jamie Ellis. Yes, these may be implicated, but the biggest challenges for beekeepers in Florida and around the country are viruses carried by tiny varroa mites, as well as weather, queen quality and bee nutrition. The public hasn’t really been shielded. Our tax dollars have subsidized honey bee losses. For the past four years, $20 million has been earmarked annually by the U.S. Department of Agriculture for the Emergency Livestock Assistance Program to compensate for losses of livestock, honey bees and farmed fish. In April, that number was bumped up to $38 million to deal with 2017’s stunning number of natural disasters (hurricanes as well as blizzards, drought and wildfires). For Hackenberg and others, this means the government is writing a check for their lost hives and revenue. But because farmers have had to pay more for a dwindling number of pollinators, Hackenberg predicts consumers will soon see increased prices in the grocery store for items like watermelon, cucumbers, cantaloupes, squashes and eggplants. Dennis Van Engelsdorp is a professor at the University of Maryland and president of the Bee Informed Partnership, which studies honey bee health on a large scale. He says the varroa mite evolved on Asian honey bees — a native and largely benign pest of another species of bees — and was introduced to U.S. honey bees in Florida in 1987. They were first found around Ocoee, many people assuming they came in on Asian bees at Orlando International Airport. Because the mites are arthropods and honey bees are arthropods, it’s hard to develop a chemical compound that will kill the mites without killing the host. But Van Engelsdorp says some of the reason agrochemical companies haven’t leapt into action to solve the mite problem is economic. For Hackenberg and other beekeepers, the mites became an ongoing problem, but one they could live with. It was around 2006 when systemic pesticides came on the market, chemicals that are soluble in water so they can be absorbed via a plant’s vascular system and moved around its tissues. Researchers like Ellis are careful to say that these systemic pesticides are not responsible for killing honey bees — in fact, Ellis thinks things like bee management need to be examined as possible contributors for honey bee decimation. And that’s where companies like Healthy Bees step in. Florida entrepreneur Lee Rosen and chief scientist Dr. Francesca del Vecchio have developed an all-natural bee food called BeesVita Plus. Van Engelsdorp and the Bee Informed Partnership are conducting a field trial of the product, an enormous study of hone bees in Argentina, Brazil, Italy, Turkey and in the United States by scientists and beekeepers in California, Pennsylvania and Florida, at apiaries like Doan’s and the Hackenbergs’. In the United States, honey bees pollinate $15 billion worth of crops ranging from alfalfa, almonds and apples to berries, cherries, peaches, pears, melons and zucchini. In the United States and Canada, 98 different crops rely on honey bee pollination, according to a 2016 White House report on the status of pollinators in North America. It takes 13 visits from a pollinating honeybee to yield a straight cucumber. Zucchini and yellow squash also require honey bee pollinators to yield straight, not curved, vegetables. Honey bee pollination is required to make pumpkins with rounded sides and to dramatically increase the tonnage of butternut squash. China is the largest beekeeping country (10 million colonies) and Turkey is the second largest (7.9 million colonies). The United States is ninth, with 2.8 million colonies. The U.S. honey bee colony population has steadily declined from a post-World War II high of about 6 million. Oct. 1 Beekeeper Jim Doan’s bees come to Fort Meade for rest and food. End of January Bees are shipped to California where they pollinate almonds for four weeks. End of February Bees head back to Florida. Mid-April Bees are shipped back to western New York (just west of Rochester) to pollinate apricots, cherries and apples. Until the end of June Bees are “rested” in a honey location. Beginning of July Bees pollinate cucumbers and summer squash in western New York. Later in July Bees pollinate pumpkins in western New York. Late August Beehives are all grouped back together and put on goldenrod to get some weight on the bees and make some honey. End of September Hives are stripped of excess honey and bees are readied to go back to Florida.